Port Ellen distillery has been closed for 25 years and the stocks of whisky produced there are getting less and less as time goes by. Originally built in 1825 on the island of Islay, the distillery had a chequered history. Now, it is renowned as one of the best and most sought after Islay whiskies and coupled with the dwindling stock, it is also one of the most expensive to buy. This contrasts with periods in the distillery's past, where it was deemed surplus to requirements and this includes a period of non-production of almost 40 years (between 1929 and 1967) and ultimately, it's closure in 1983. Most of the distillery has now been dismantled or demolished, although the malting facilities are still operating and supply malted barley to a number of other distilleries on the island. The maltings and most of the existing whisky stock are owned by drinks giant, Diageo and they occasionally release bottlings that are snapped up by collectors around the world. Independent bottling companies also hold some stock and some of these releases are more common and slightly cheaper. This bottling is released by Royal Mile Whiskies and is available only in their two shops in Edinburgh and London or via their website. A single cask has been bottled, so there are only 255 bottles available and they are available for £95 each. So you will have to be quick if you want to buy one! The nose is gorgeous. It is smoky but quite subtle smokiness (the longer a whisky matures, then the less smoky it becomes) with sweet maltiness and a salty note coming through (it reminded me of sea air in a way). The smokiness is fragrant and quite earthy and mossy. On the palate, all of these elements are present and mix beautifully with something nutty, woody and there is a bitter element (iodine, which is a classic Islay characteristic). The finish is long and combines the smokiness, saltiness and sweetness almost perfectly, although it is a bit dry right at the end. This is a cracker and lives up to Port Ellen's reputation. It is complex yet quite light and delicate for something that has been aged for 25 years. 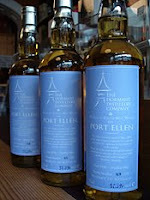 If you ever get the chance to try any Port Ellen, then do not hestitate. The Cragganmore distillery is situated in the heart of the Speyside region, near to the village of Ballindalloch. It has a capacity of just over 1.5 million litres per year and was opened in 1869. Cragganmore is currently owned by multi national drinks company, Diageo and much of the whisky produced there is used in a number of Diageo's different blends. 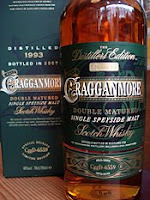 The Cragganmore single malts have a good reputation and there are two main distillery releases - the 12 years old, which is one of Diageo's six 'Classic Malts' representing Speyside in that collection and this 'Distiller's Edition'. Other bottlings are occasionally released and independent bottlings are fairly common. This 'Distiller's Edition' is bottled at 14 years old and is the regular 12 years old that has then been transferred into a Port wine cask and matured for a further two years. The colour is dark and golden, like caramel and the nose is really good. It is rich with lots of fruit present (it reminded me of stewed fruits like figs, apples and prunes) plus dried fruit (imagine raisins and sultanas) and a hint of burnt sugar coming through. It also became more woody and herbal (grassy almost) with time. The taste was slightly disappointing following the promise of the nose, which was sweeter. Again, there are the dried and stewed fruits, the burnt sugar/ caramel and these are joined by alot of vanilla and fresher red fruit and grapes that must be coming from the influence of the port cask. Considering that this whisky is quite creamy and rich, the finish is quite short. The flavours are intense but disappear quite quickly and right at the end, it leaves you mouth feeling dry and something bitter comes through (similar to the woody, herbal element from the nose). This is a decent whisky and it is interesting to try different cask finishes and see how they influence the final product. It would be very good as an after dinner drink or as a replacement for dessert. This is a limited release and is available in specialist retailers only for between £35-40. Benriach is an independently owned distillery in Speyside. Located between the towns of Elgin and Rothes, this distillery was originally opened in 1897 but mothballed (this is when production is stopped but everything at the distillery remains intact) in 2002. 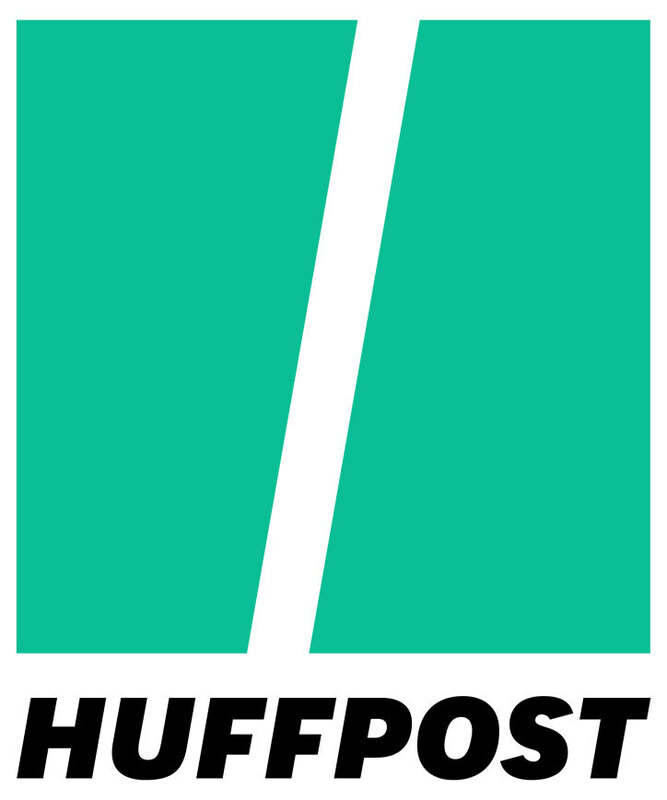 Production restarted in 2004, following a change of ownership. The new independent consortium decided to return to traditional regional distilling methods whilst also being an innovator and trying to attract new consumers. 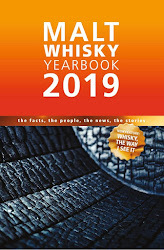 They decided to use peat in their kilns, a practice that had died out in the Speyside region almost 100 years earlier and had whisky traditionalists frowning. As a result, they were one of the first Speyside distilleries to release some peated, smoky whiskies for a very long time. 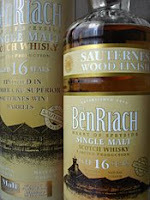 A few others are now following Benriach's lead. It is interesting that by returning to tradition, that they are seen as innovators! As mentioned, the new owners decided to attract new customers to their whisky by also experimenting with different cask finishes. These are released as limited editions and include whiskies that have been finished in sherry, port, rum and Madiera wine casks. Benriach also release a core range of 'classic Speyside style' whiskies with different age statements and independent bottlings are readily available. This particular bottling is a limited edition 16 years old that has been finished in Chateau d'Yquem Sauternes wine casks. It costs just under £40 per bottle from specialist retailers and only 1650 bottles are available. We had to snap one up! The colour is golden and the nose is great and very promising. It is full of sweetness with a mixture of vanilla, honey, toffee, something floral (think of honeysuckle) and dried fruits (imagine sultanas). This is balanced with something light and fresh, that reminded me of fresh white grapes or a crisp white wine. On the palate, this is gorgeous and buttery with all the notes from the nose present. It is the lightness of the spirit in the mouth that is surprising, as the expectation would be that it would be richer or sweeter, as Sauternes is a very sweet, thick dessert wine. The finish is long but again light with the vanilla, honey and white wine notes prominent. Benriach have released a really good whisky here and it would be an excellent whisky to give to someone who maybe thinks that they don't like whisky. The combination of the age and the finishing in the Sauternes cask gives a great balance that is not too sweet or rich, which can tend to put people off a Sauternes finished whisky. Bowmore is one of the oldest distilleries in Scotland. It is located on the island of Islay, which lies off the west Highland coast, and started production of whisky in 1779. 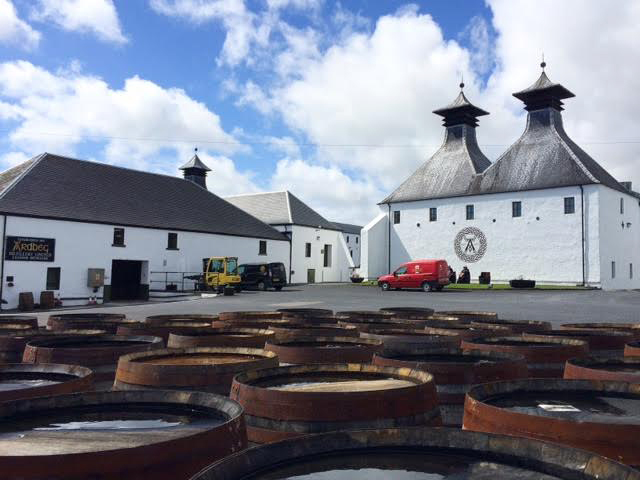 This makes it the oldest distillery on Islay and it has a current capacity of 2 million litres per year. Bowmore is one of the most famous whiskies in the world and the number of different releases is extensive. The core range consists of a 12 years old, this 15 years old 'Darkest' and an 18 years old. These are joined by more limited releases from time to time. Independent bottlings are fairly common. 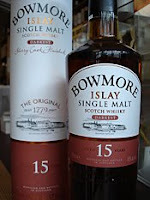 Bowmore also has another range of whiskies that are available exclusively for travel retail/ duty free. The 'Darkest' is available almost everywhere in the UK, from larger supermarkets to smaller specialist retailers. It has been matured for 13 years in bourbon casks and then for the last two years, has been placed in Pedro Ximinez sherry casks. The colour is dark and golden and the nose smells rich and fruity. There is lots of dried fruit (imagine raisins, sultanas, candied peel), an underlying smoky character (this is a bit meaty and reminded me of smoky bacon crisps!) and something bitter, like a good dark chocolate. The palate is complex and rich. There is loads of vanilla (this comes from the bourbon cask maturation) and loads of dried sweet fruit (this comes from the sherry casks, as Pedro Ximinez is a very sweet style of sherry). They are joined by that smokiness again and also something slightly acrid that reminded me of burnt sugar or black treacle. The finish is creamy, warming and long with the dried fruit sweetness prominent and the smokiness lingers, slowly fading to nothing. This is a very good whisky and demonstrates a good balance between the influences of the different cask characteristics and the smokiness. Bowmore is one of the lighter Islay malts, as the malted barley contains relatively low phenol levels (around 20-25 ppm) compared to it's neighbours (eg. Ardbeg is 55 ppm). This gives it less smokiness and more subtlety, making Bowmore a good choice for those who don't like the full on smoky, peaty flavours or as an introduction to these characteristics. A bottle of this should cost between £40-45. America is one of the world's largest producers of whiskey and there are numerous different types, each with their own unique ingredients or production methods. 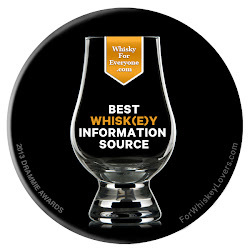 The six different categories are bourbon, Tennessee, rye, corn, wheat and blended whiskies. Whiskey was introduced to America by the immigrants and pioneers that went over to the continent from Scotland and Ireland in the 1700s. These settlers were forced to use different raw materials to produce their whiskey due to the different climate and soil conditions. This included mixing different grains together during the mashing process depending on what was available. Over time, these different recipes of grain mixtures have evolved so that now, American whiskey bears very little similarity to Scottish or Irish whiskies. The industry has strict laws about the naming or categorising of the whiskies and here I will explain the differences. Many people believe that these whiskies are so named due to their location. All bourbons are made in the state of Kentucky but there are in fact no working distilleries in Bourbon County. Most are situated in the north east corner of the state and the name actually refers to the production method. Bourbons must contain at least 51% corn (maize) in the mash and the new spirit must be distilled below 80% ABV. The new spirit must then be matured in new American white oak barrels for a minimum period of at least two years. American white oak has a high level of natural oils in the wood (called vanillins) and these give all American whiskies their distinctive vanilla and woody flavours. The combination of using new barrels and the higher temperatures and differing surrounding climate, mean that American whiskies mature much faster than those produced in Scotland and Ireland. Also, no colourings or flavourings can be added to a bourbon whiskey. There are seven different bourbon distilleries in Kentucky and these produce numerous brands of whiskey, all using unique recipes. The seven distilleries are Bernheim, Buffalo Trace, Four Roses, Jim Beam, Maker's Mark, Wild Turkey and Woodford Reserve. There are very few differences between these and bourbons, as the grain/corn percentages in the mash and the ingredients are the same. The two main differences are that Tennessee whiskey can only be produced in the state of Tennessee and that the new spirit is filtered through charcoal, once it has been distilled. This process takes 10 days and the charcoal that is used must be from the sugar maple tree. After this has occured, the maturation procedure is the same as that of the bourbons. There are only two distilleries currently in operation in Tennessee - George Dickel and Jack Daniels. Most rye whiskies are used in the production of blends, but some are released in their own right and called 'straight rye'. These can be produced at any distillery but the laws dictate that at least 51% of the mash mixture must consist of rye. similarly to the bourbons and Tennessee whiskies, the ryes must be distilled at less than 80% abv and must be stored in new American white oak casks for a minimum of two years. Some well known rye whiskies are Pikesville, Rittenhouse, Sazerac and Van Winkle. This was the first type of whiskey that the new settlers to America distilled as corn or maize was the easiest thing to grow. The mash mixture must consist of at least 80% corn and does not necessarily have to be aged. If it is aged then it is normally for a short period (no longer than six months) and in regular wooden barrels or ones that have been previously used for maturing bourbon. Wheat whiskies are very rarely released as the majority that is produced goes into blends. They must contain at least 51% wheat in the mash mixture but are then matured in the same way as bourbon, Tennessee and rye whiskies. 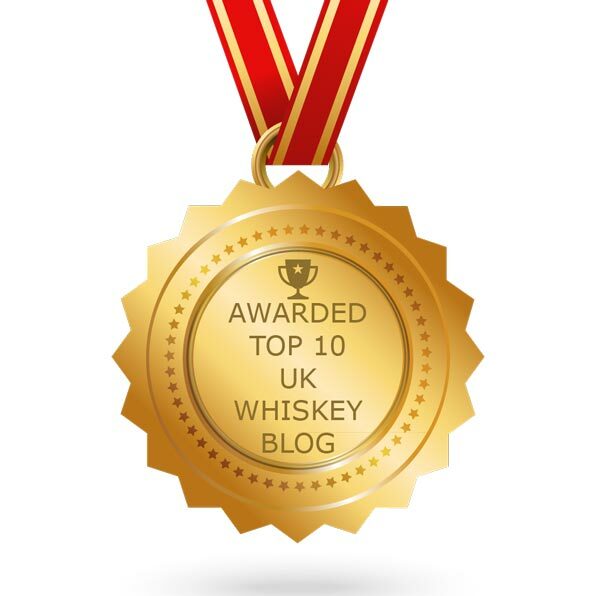 These are a very common and cheaper alternative to any of the other American whiskies. They are different from Scottish or Irish blends in that only a small amount of the whiskey used has been matured (usually bourbon or rye) and this is then blended with neutral spirit. Only 20% of the blend is actually matured whisky with the other 80% being the neutral spirit. 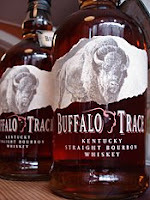 Buffalo Trace is an American whiskey from the northern most distillery in the state of Kentucky. There are seven distilleries in Kentucky and these make different brands of American whiskies and bourbons, each one with it's own unique recipe. However, Buffalo Trace is the only distillery where the whiskey is made entirely on the same site using only traditional methods. The distillery name originates from it's close proximity to 'the great buffalo trace', which is an ancient migrating path (or trace) used by buffalo that stretches across North America and along the banks of the Kentucky River. Early settlers followed this path and set up a community in the late 1700s and the distillery has been operating on the same site since 1812. It was also one of the few distilleries to continue distilling during the prohibition period (purely for medical purposes, of cause!). Now, Buffalo Trace is regarded as one of the best American whiskies in the world and has won numerous awards. This whiskey has been aged for a minimum of nine years and is made from a selection of corn, rye and malted barley which are all grown in Franklin County, near to the distillery. The colour is dark and golden and the nose is gorgeous. There is lots of vanilla and coconut with a bitter grainy note coming through (imagine the aroma of a dense type of bread, like rye bread). On the palate, this is soft, thick and creamy with lots of that vanilla and coconut present. Following this, some more subtle flavours are revealed with something citrus in there (lemons, I think), something spicy (nutmeg or cinnamon, I'm not sure), a hint of aniseed and some toffee. The finish is quite long and starts off sweet and creamy but interestingly twists to be slightly bitter and dry right at the end. Buffalo Trace is extremely well balanced and complex and is my favourite American whiskey that I have tried to date. It is also a bargain for something that is so good and that has won so many awards, costing just over £20 per bottle. Buffalo Trace is becoming more wide spread in the UK all the time and is available in some supermarkets and numerous independent retailers, as well as becoming extremely popular in bars and pubs if you want to try it before you buy a full bottle. The Toucan is a gem of a bar in the centre of London. It can be found in a side street, just off Soho Square and is a must visit for Irish whisky fans. The bar on the street level is compact (as a result there is normally a crowd of people standing out in the street supping on their pints of Guinness!) and looks like any other Irish themed bar. It is when you go down in to the basement bar, that you discover the real treasure. This bar is even more compact and cosy and has the biggest selection of Irish whisky that we have ever seen. The collection is extensive and the range covers all the regular big names, rarer bottings from these big names, smaller brands and numerous other rare and discontinued whiskies, some of which are kept padlocked! Check out their whiskey menu, order something and then sit and savour with a pint of guinness. On our recent visit, we tried three very good whiskies. This is a pure pot still whiskey produced at the Midleton distillery. Pot stills are frequently used in Ireland and these are short, fat, large stills that produce softer and more rounded spirits. The spirit is further softened by being distilled three times, instead of twice in Scotland. This is one of my favourite Irish whiskies and I had not tried it for ages. The nose is light and fresh with some vanilla, honey and fruitiness, like fresh apples and pears. On the palate, these notes are prominent and are joined by dried fruit (imagine raisins and sultanas) and a bit of spiciness (crushed black pepper, I think) right at the end. It is creamy and rich but very fresh at the same time. The finish is long, complex and very well balanced. This cost £4.50 a shot and we enjoyed it so much that I went and got a bottle the next day. This whiskey is a special release that was to be discontinued, but is now rumoured to be re-released soon. The nose is light and full of vanilla and nuts (imagine almonds). The palate is smooth and very light with the vanilla and almonds being joined by dried fruit (raisins and sultanas), some maltiness and a blast of toffee. There is also some dryness and the overall feeling is very cleansing. The finish is shortish and gives a creamier and richer feel than at any other time, with the dried fruit particularly prominent. A hint of something spicy (nutmeg, I think) comes through right at the end. Again, another of my favourite Irish whiskies and it cost £3.50 a shot. For the final whiskey of the evening, I decided to push the boat out and buy something more limited. This is a commemorative bottling from Bushmills that is celebrating the 400th anniversary of them being awarded their license to distil and there are not that many bottles being released. The colour was much darker than most Irish whiskies that I have had before and the nose is full of dried fruit (those raisins and sultanas again), honey, vanilla and a strong whiff of sherry. This is very smooth and silky in the mouth with all the elements from the nose present being joined by a blast of toffee and a spiciness that reminded me of nutmeg or cinnamon. The finish is long and creamy with lots of vanilla and toffee, but is maybe a bit woody and dry towards the end. This is a good whiskey but I am not sure that it was worth the £10 a shot that I paid! Glen Moray is located just outside the town of Elgin in Speyside. It originally started production in 1897 and the distillery was housed in a renovated brewery building. In 1920 the distillery was taken over by a family firm called Macdonald & Muir (they later became Glenmorangie PLC) and following a major reconstruction in the 1950s, the distillery has been operating ever since. 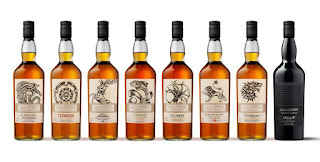 Glenmorangie PLC was taken over by multi national drinks company Moet Hennessey in 2004. The distillery produces around 2 million litres per year and they mostly release this 'Classic', which has no age statement, as well as occasional other limited bottlings (12, 16, 20 and 32 years old). this 'Classic' whisky is positioned at the cheaper end of the market and as a result is in the top 10 single malt sellers in the UK. The colour is very pale and the nose rips your nasal hair out! Not a great start and one that shows there is some very young whisky present. Young whiskies are more alcoholic and the other characteristics have not had time to mature, so this gives them a very prominent alcoholic burn on the nose and palate. 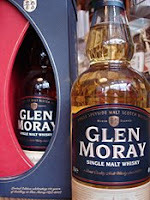 This sensation is present in this Glen Moray and masks any other characteristics that may be present. It is a similar story on the palate. There is an initial blast of spirit and feels very rough, thin and almost fizzy in the mouth. Some other characters start to come through eventually, with some fairly pleasant maltiness and something herbal (imagine freshly cut grass) revealing themselves. Matt, my work colleague, tried this with a drop of water and said that it was less aggressive on the palate and fruitier (like dried fruits) but then suddenly became quite bitter. The finish is short and has a strange twist. It begins with that grassiness from the palate but then the last sensation you get is bitter and acrid, like something burning. This is not a great whisky by any stretch of the imagination. It is one dimensional and at times rough and unpleasant. However, it is cheap and cheerful (around £20 a bottle) and would be a decent option if you wanted a whisky to have with a mixer or in a cocktail. Dallas Dhu (pronounced dallas doo) is a distillery that has been closed since 1983. It was based near the town of Forres and originally opened in 1898. Now, the original distillery buildings are a museum that are owned and run by Historic Scotland. As the distillery has been closed for 25 years, the stock is dwindling all the time and will one day run out. Because of this, Dallas Dhu whisky is becoming more and more desirable and the prices for it are increasing. There are only a couple of independent bottlings available, including this one from Gordon & Macphail. This was distilled in 1982 and bottled in 2007. The colour is quite pale and straw like, which is surprising for something of this age and the nose is fragrant and very promising. There is vanilla and malty grain present and these are joined by some intense fruitiness (pears and apples come first but then something tropical that reminded me of pineapples and mango). These characteristics can be associated with the increased age of the whisky. On the palate, this is rich and fruity with the maltiness and vanilla balancing everything perfectly. Nothing overpowers anything else. There is also something a bit spicy (think of nutmeg or cinnamon) which adds more interest at the end. The finish is fairly long and very refreshing, making the whisky very easy to drink and perfect for a warm day or someone new to whisky (who has expensive taste!). This is an excellent, extremely well balanced whisky and one that must be tried before the stocks run dry. It is available from specialist retailers or directly from Gordon & Macphail, and should cost around £55 per bottle. This is very good value considering the whisky is 25 years old and from a closed distillery. Half bottles (35cl) are also for around £30.